If you have type 2 diabetes or prediabetes, you may be thinking wheat fits into your diet, especially if you choose whole grain wheat bread and eat whole grain wheat crackers. However, you'll soon be surprised to learn that there's more to the wheat story than meets the eye. And in actual fact, wheat and diabetes don't make a great match – whole grain or not. Like most grains, wheat can be broken down into two categories that you may already be familiar with: whole grain and refined grain. Just like the name suggests, these grains are “whole” because they have not had the germ and bran removed during processing. Therefore, it's usually easy to spot whole grain breads, crackers and cereals because they tend to be darker in color (brown) than refined products (white). Whole grains are considered to be healthier than refined grains because they are more nutrient dense and they contain greater amounts of fiber. And you'll often see whole grain breads or cereals advertise their “healthiness” on the packaging. Whole grains are complex carbohydrates that raise blood sugar levels a little slower than simple carbs do. The refining process of wheat removes the germ and bran, leaving only the center (called the endosperm). This process creates a finer textured flour and gives the product a longer shelf life (great for product manufacturers). But, the refining process also removes most of the fiber, iron and B vitamins, making the product devoid of nutrients. Refined wheat products often have added sugar in them to make them even more appealing. The most common refined wheat product is white bread – the infamous “Wonderbread” being a prime example of a refined grain product. Refined grains are simple carbohydrates that tend to raise blood sugar very quickly and have little nutrition to offer your body. 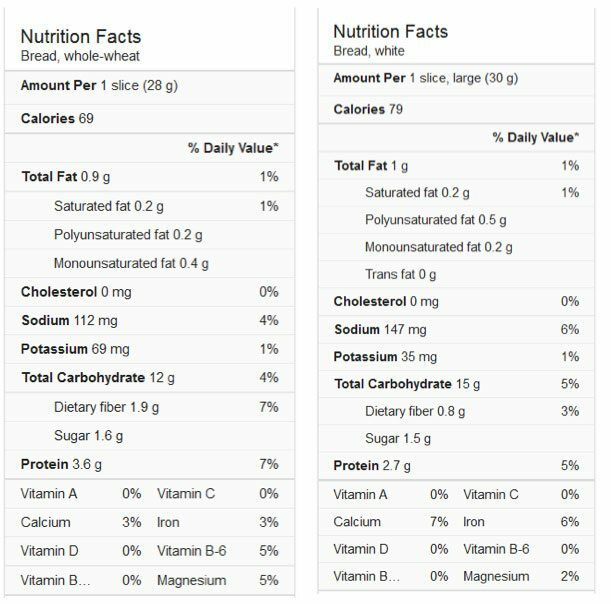 Take a closer look at the difference between whole wheat and white bread in the two nutrition labels below. You will see that the white, refined bread is higher in calories and total carbs, but lower in vitamin B than the whole wheat bread is. Oftentimes white breads will have ‘added' vitamins, which makes them appear more nutritious. But, ‘added' vitamins are not the same as eating real vitamins from a natural food source – they are not as effective for the body. What is not shown on either nutrition labels is the glycemic index, which is also important to consider. The glycemic index (GI) of a food tells you how slowly or quickly a certain food will raise your blood sugar. As a diabetic, you want to select foods that have a low or very low GI – a GI of 100 is considered high and below 55 is considered low. A piece of whole wheat bread has a GI of 69, and a piece of white bread has a GI of 73. Yes, the whole wheat bread has a slightly lower GI than the white bread, but does that mean that either bread is a good choice? Let’s put these numbers into perspective: both peaches and strawberries have a GI of only 40! You wouldn’t suspect that wheat has a higher GI than both peaches and strawberries, because most bread products don’t taste overly sweet. Bread, whole grain or not, is a high carb food that is also high GI. So it just goes to show that you can't believe everything you've been told about a food being “healthy,” particularly when it comes to good blood sugar control. To put this GI thing to even better use, choosing non starchy veggies such as broccoli (GI 15), carrot (GI 20), asparagus (GI 15), celery (GI 15), tomato (GI 30), etc, is a great way to regulate blood sugar and A1c. Pasta is another very popular wheat product. 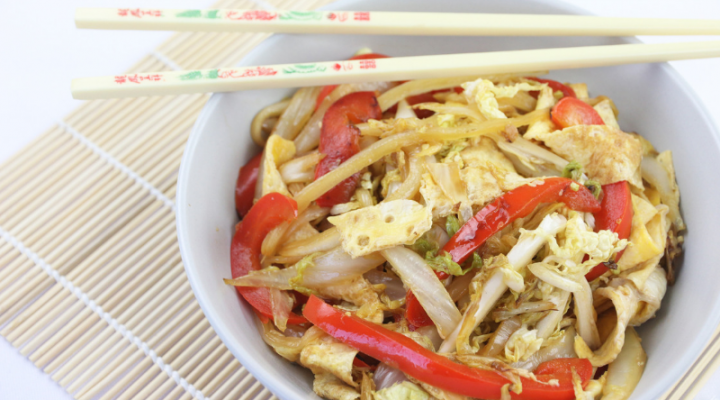 But even a small bowl of noodles packs in a ton of carbs that can raise your blood sugar to unwanted levels. For instance, a half cup white pasta is around 21 grams carbs and whole wheat is still high at 18.5 grams. The theory goes that: complex carbs are superior to simple (refined) carbs because they break down into sugar more slowly, which results in more stable blood sugar. That's the theory. While this is true to a certain extent: complex carbs are a healthier choice than white refined products. 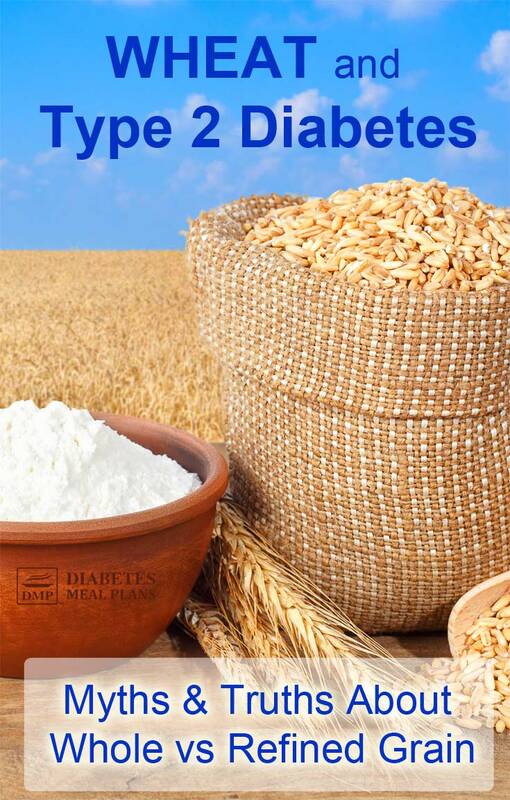 Whole grains are still not suitable for a diabetic diet because they contain too many carbs. If you already have a dysregulated blood sugar, eating high carb foods is not going to help ‘stabilize' blood sugar levels. Carbohydrate is the nutrient that has the greatest influence on blood sugar and A1c levels. Myth #1: Throughout your life you’ve probably heard that grains are a healthy staple for every diet. After all, the USDA food pyramid (and similar food pyramids worldwide) have shown that wheat and grain products should be the foundation of your diet. In fact, for years the recommendation is that you should be eating 6 to 11 servings of wheat and grains every day! Once type 2 diabetes got a spotlight in mainstream health education, they began to change their tune (just slightly) to accommodate some “healthier” changes. 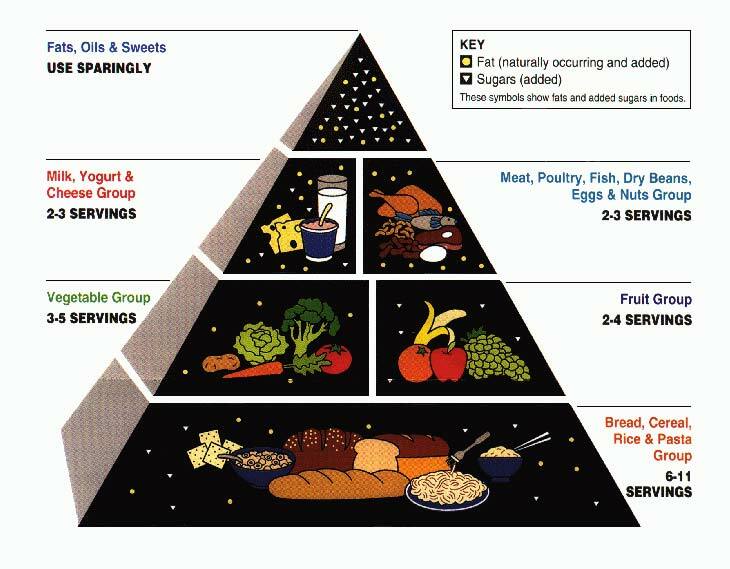 Alterations were made to the USDA food pyramid in 2005, only this time, they said that grains were OK, as long as they were “heart healthy,” whole grains only. Truth #1: The truth is that the wheat and grain based model of a balanced diet is not suitable for people with diabetes who are trying to treat their condition. 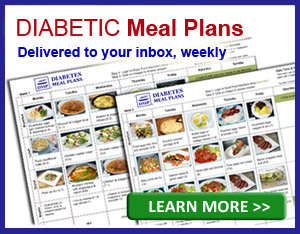 The American Diabetes Association state in their 2017 Standards of Medical Care in Diabetes, that: “whole-grain consumption is not associated with improvements in glycemic control in type 2 diabetes.” Or in other words, it doesn't help you regulate blood sugar and A1c – that's what the research clearly shows. The truth is, if you want to lower blood sugar and A1C, you'll find that high carb grain-based foods won't help you do it. 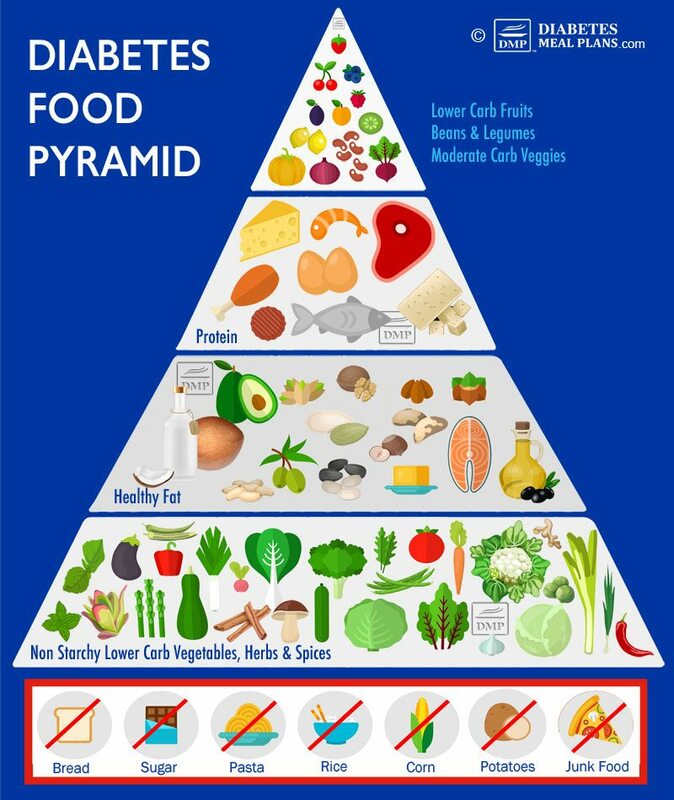 What we've found (and so has research) is that diabetics have great success when they cut all wheat and grain based products from their diet, which is why we have redesigned the diabetes food pyramid. Myth #2: Whole grains are a great source of fiber. Truth #2: Whole grains do have some fiber, but you can get much more fiber (and spare yourself the carbs) by choosing vegetables instead. For instance, a whole wheat slice of bread has 1.9 grams of fiber, but you can get that same amount by eating a medium sized carrot (1.7 g). And from half a cup of broccoli you get even more – 2.6 g fiber! Non starchy vegetables are a much better source of fiber, so are things like chia seeds, flax seeds and nuts. 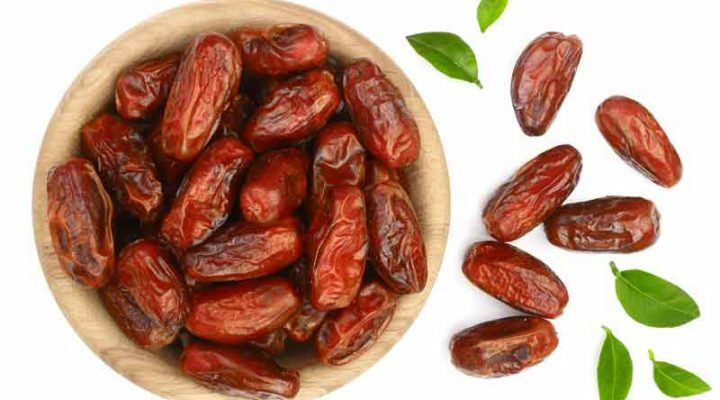 And the benefits of these foods are they provide ample nutrients and won't send your blood sugar soaring. Research suggests that eating a diet with lots of whole grains can help lower your risk for diabetes. While this may be true, the thing to be aware of here is that these studies are focusing on how to prevent type 2 diabetes, not how to treat already existing diabetes – treatment and prevention are two different things! Overall, the research confirms that a lower carb diet is best for the management and treatment of diabetes, which means that even whole wheat products should get the boot – they just rack up the carbs too quickly. In addition to being notoriously high in carbs, wheat products have increasingly been getting a bad rep in the research and nutrition community for other reasons. Gluten is a protein found in wheat and there are many studies that link gluten to adverse health effects. For instance, one study found that participants who ate gluten products were more likely to have increased intestinal permeability than participants who ate gluten free diets. 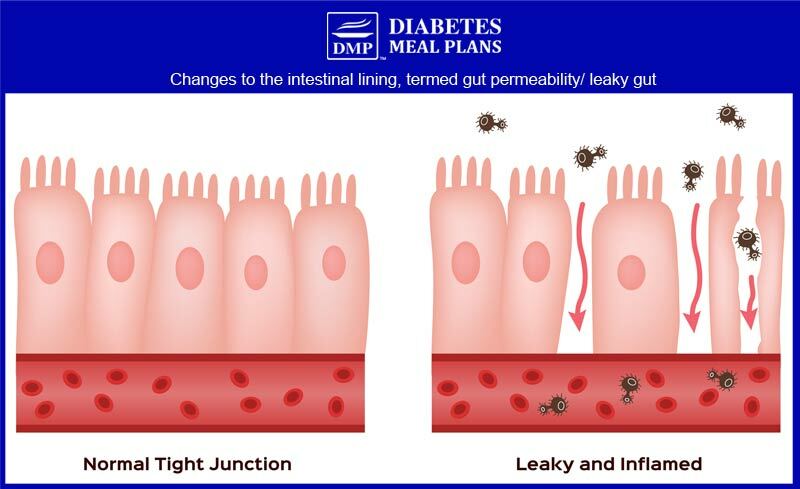 ‘Increased intestinal permeability' (also called ‘leaky gut') is a fancy way of saying that you have tiny gaps in the lining of your intestines. A component of wheat (gliadin) is known to cause these gaps by disassembling the tight junctions in the gut. As you can imagine having gaps in your intestinal lining is not good. These gaps can lead to food allergies, an imbalance in gut bacteria, and even food toxins leaking back into the bloodstream – the toxins that are meant to be eliminated from the body. And interestingly, the researchers found that intestinal permeability occurs in people that have gluten sensitivity as well as those who do not have any known gluten sensitivity! The medical community used to think that intestinal damage only occurred when a person with celiac disease ate gluten, but now they are finding that many people are negatively affected by gluten. Gluten consumption has also been linked to cognitive disruptions (aka “brain fog”) and irritable bowel syndrome. As mentioned above, it is important to note that these consequences can happen in people who do not have celiac disease. Finally, gluten has been linked to hormonal dysregulation like hypothyroidism (low thyroid function), especially in women. 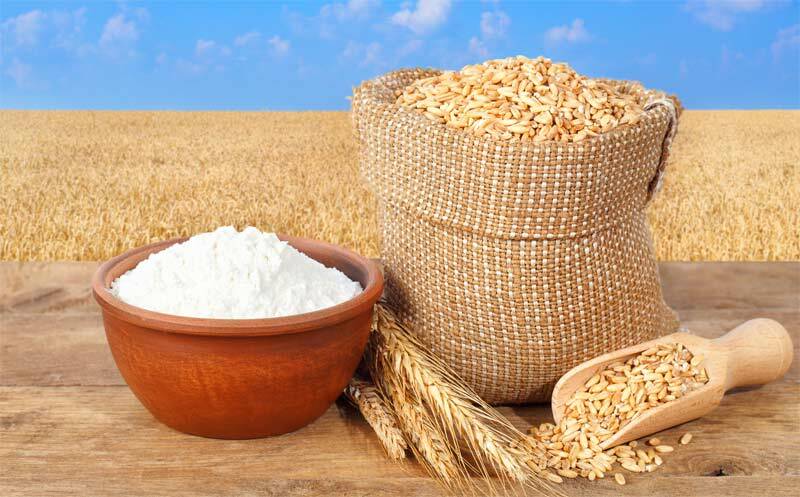 There are plenty of obvious wheat sources such as flours, baked goods, pastas, cereals, pizza crusts, and breads. But you have to be cautious, because you also find wheat included in nearly every single processed food from sauces and condiments, to dressings and meats, to beverages and soups. Wheat products are a high carbohydrate food and have a high glycemic index, so they don't make a great match if you want to keep your blood sugar and A1C under control. There is no research to show wheat or whole wheat provides any benefit or assistance for better blood sugar control. Plus, once you consider the research about gluten's potential to negatively affect your health, then the case against wheat becomes pretty clear: just say no! That doesn't mean you have to live without bread, cereals and crackers, it just means using alternative low carb options – and there are plenty of them. 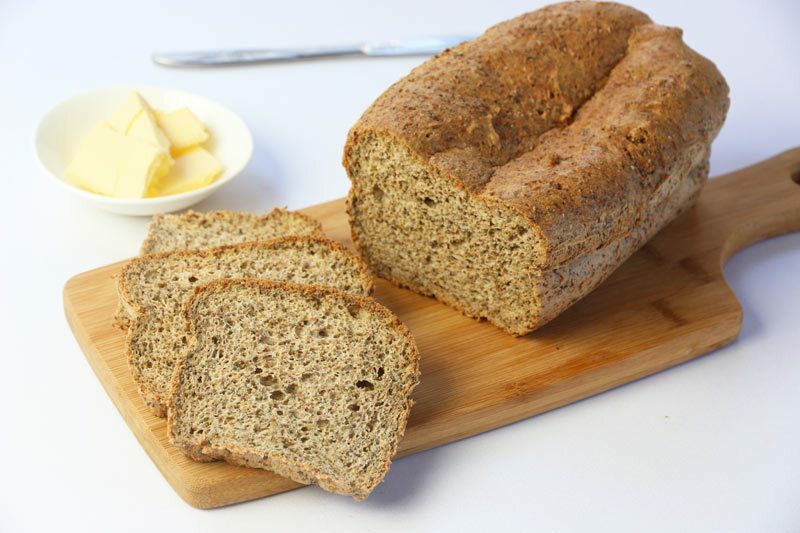 For instance, we make all our Low Carb Breads with low carb flours that don't spike blood sugar and A1c. Wholemeal Sandwich Loaf: 1 gram net carbs! 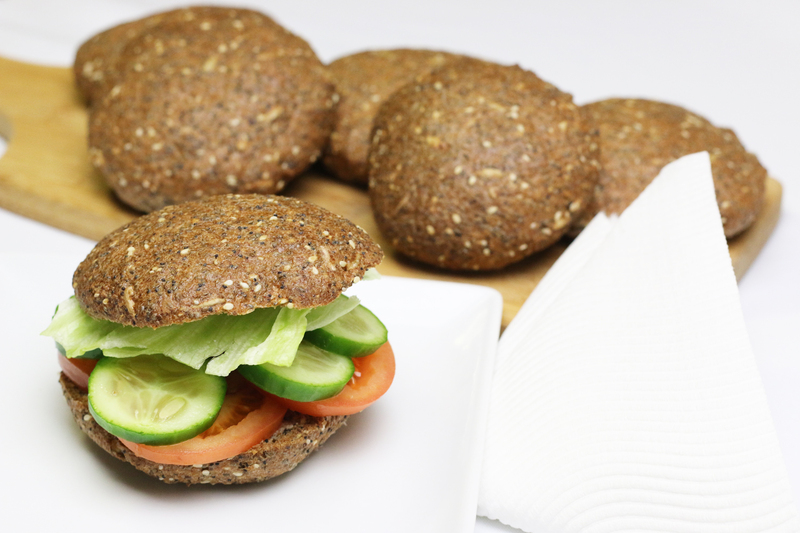 Seedy Sandwich Buns: 2 grams net carbs! Sure, it can take a little getting used to living without your favorite wheat products. But it's worth it because your diabetes (or prediabetes) will definitely improve by cutting wheat products out of your diet. 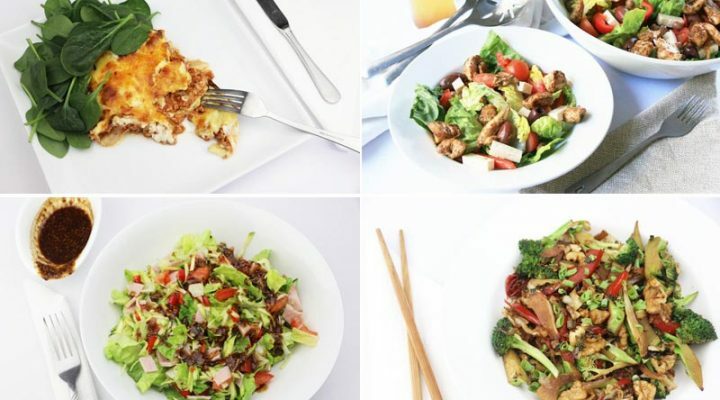 “I learned that alternative foods are just as delicious as “normal” foods. I've lost 16 lbs since I went low carb. I'm not as fearful about eating fat and my daily blood sugar readings are slowly going down. I have really learned a ton from this site. Thank you for all of your efforts.” ~ Cheryl A. Thank you for your insightful and educational articles. I have been recently diagnosed with type 2 diabetes and I’ve gotten immeasuarable assistance in controlling my blood sugar from your articles. I am not on any meds and I use diet and exercise for control. I recently came across banana flour and I was wondering what are your views on its use by diabetics. I have never heard of banana flour, however it appears to be a pretty high carb food (44 grams per 1/2 cup.) I would not recommend using it, instead try something like almond, coconut, or ground flaxseed meal. Should i count the fibers in vegetables and seeds (like flax and chia seed) in counting my 50-80gm carbohydrates? Yes Laura. In general that’s 50-80 grams total carbs, if you subtract the fiber it’s net carbs. You can read about the difference between net and total carbs here. Both are useful. How can i balance between eating 50-80gm carb and increasing the veggies intake that is full of fibers? With eating more than 5 serving veggies i may exceed my allowed limit. I am taking flaxseeds, veggies, avocado, one portion of fruit, milk yougurt and other diary products. In total this would be more than 80gm if i added more veggies. It can be a balancing act Laura. We include tons of veggies, along with dairy, nuts, seeds, avocado etc and still stay under 80g. If you’re choosing beneficial foods and your fiber intake is high, then going up to 100g per day is acceptable. We have some members managing their diabetes well at this level. The most important thing is you monitor your numbers and determine what’s going to work for you, if your numbers are going down or staying stable that’s good.